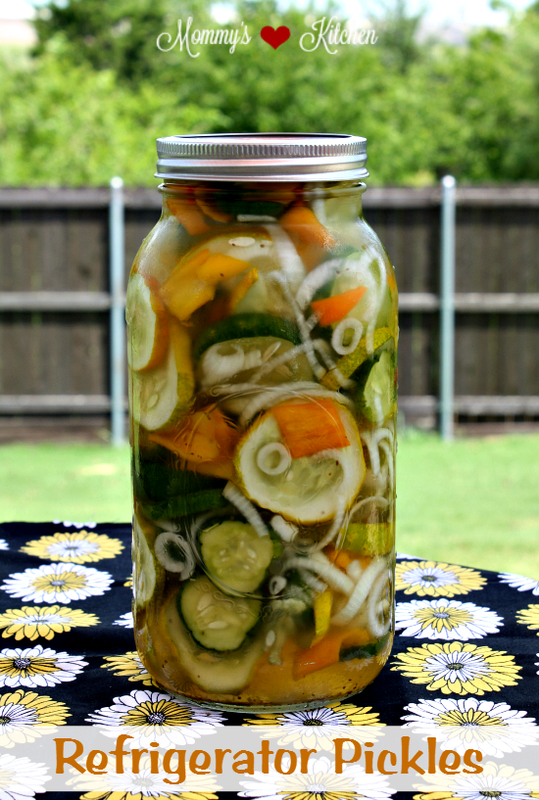 Preserve your garden produce with these simple Refrigerator Sweet Pickles (No-Canning-Needed). If you have ever grown cucumbers or zucchini then you know that you will be blessed with an abundance of each by summers end. Today's recipe for Refrigerator Sweet Pickles is from the cucumbers, onions and bell peppers that we harvested late last summer. For some reason I forgot to post this recipe on my blog and it's too good not to post. By the time your cucumber plants start producing they can get out of control pretty quickly yielding 3-4 cukes per vine per day. Before you know it you'll have cucumbers growing out of your ears. This recipe is a great way to use cucumbers and onions from your garden, but in my case, cucumbers, onions and bell peppers. I found this recipe last year on one of my favorite blogs and I've made it 3 times since finding it. The best part about this recipe is that these crunchy pickles will keep in the refrigerator for up to 2 months without having to be processed. These sweet-crunchy pickles are easy to throw together and perfect for sharing with family and friends. I hope you'll give this recipe a try! Slice cucumbers, onions, and peppers. Pack vegetables tightly into a large glass jar (I used a half gallon 64 oz mason jar). Combine remaining ingredients in a medium sizze bowl and stir well. Pour the mixture over cucumber mixture. Refrigerate about 2-3 days before eating. Pickles will store in the refrigerator for up to 2 months. Cook's Note: If you are looking for a few another pickle recipe try my recipe for Zucchini Pickles. This recipe is my favorite for zucchini overload! I have always been a big pickle fan so this is right up my alley. I have a couple of friends that are also huge to go fan so between all of us we will get these gone real quick. I love pickles! Homemade are always the best. If I get time and cucumbers, I'll have to make some! First, your garden looks amazing! I'm so jealous right now. I've never tried to can sweet pickles but I would love to one day. We love pickles in my household. I love pickles. As soon as they come home from the store, they're gone. I'm going to try this with my dad's cucumbers. 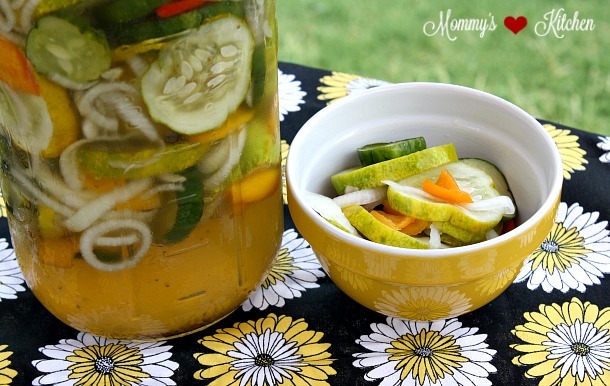 I love homemade sweet pickles! I'm saving this link for future reference! Fridge pickles are the best! They are so easy to make and everyone in our family really seems to enjoy them. This is fantastic. I grew cucumbers for years and had such good luck with them. We literally had to give so many away. This recipe sounds like the perfect way to can and store or even give as gifts. Oh what an interesting idea to make with your home grown veggies, I am going to have to share the recipe with a friend I know would love it! My mom made these every summer when I was growing up. I've never made them and I want to give it a try. Thanks for reminding me of the sweet memories of my mama today. Ohhhhhhhh this is such an awesome idea. 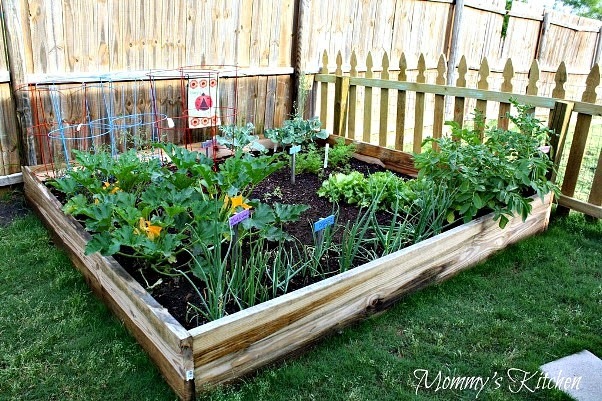 I am totally going to try this with our veggie garden once veggies start harvesting. I want to plant a veggie garden, it has been on our to-do list for a while now. I love the idea of sweet pickles, sounds delicious! My kids like to just snack on pickles, quick and easy sack for them. Yum!! I love pickles but I've never tried canning. Love that these are easier to execute. Is that your garden already? you must live someplace warm! I was just able to plant mine this week - we are still in the 40's at night around here. 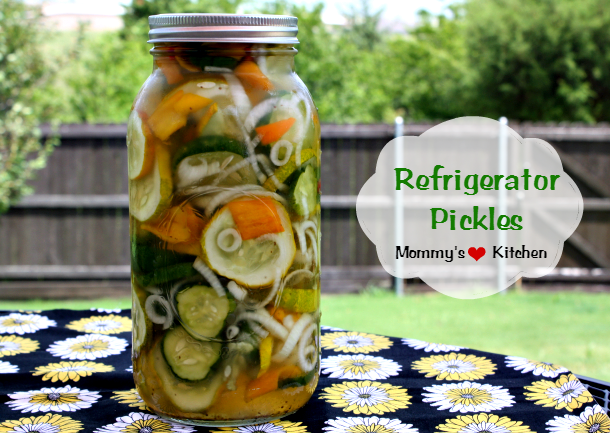 My grandmother used to make those pickles - SO good!! OMG I love pickled vegetables but never thought to pickle my own! I really have to give this a try! Do you have to include the sugar? Is it too sour without it? We try not to use any sugar in anything because of our kids - We don't even have any in the house. I have always loved pickles but not vinegar which is funny to everyone. 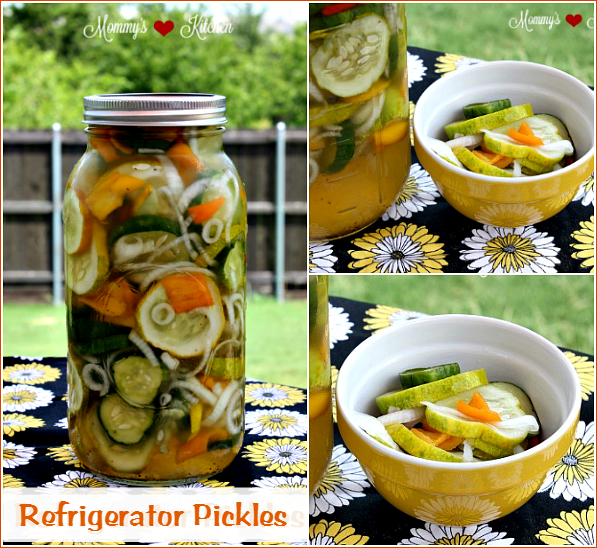 The recipe for these Refrigerator Sweet Pickles is something I will have to try for sure. Thanks for sharing the recipe. @Tiarasandtrantrums no, that was last years garden. We do live in Texas so we can start a bit earlier than others it just depends on the weather. This is a nice recipe, my grandma prepares pickle for our family. I am sure going to give her a few ideas from this and force her to make this one, I like pickles so much with each meal. I canned some pickles a couple of years ago. I haven't canned since, but those turned out alright. They weren't as good looking as these, but they were alright. this looks like an amazing side dish that I will have to try out... I love healthy foods and esp ones from my garden : ) thanks for the recipe! I have never try pickles with cucumber. Thank you for sharing the recipe! Gonna try it, looks so delicious.